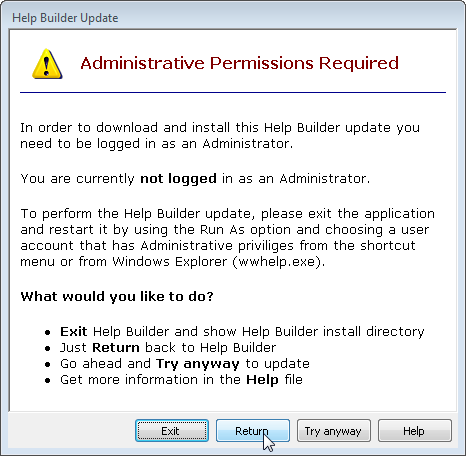 Since Help Builder's update mechanism updates the application overwrites the main executable as well as a number of support files the update process requires that you have read/write/modify permissions in the Help Builder installation directory. Under Windows Vista's default configuration with User Account Protection enabled or XP with LUA enabled these permissions are not available and so the update may fail. Help Builder checks whether your account is running as an Admin account and if not prompts you to exit Help Builder and restart it as an Admin user before attempting to perform the update. Exits Help Builder and opens a Windows Explorer Window in the Help Builder directory. From there you can select wwhelp.exe right click and select Run As Administrator to force Help Builder to run as an Admin. This option merely returns to Help Builder without doing anything. No update is performed. This option lets you attempt to run the update anyway. Use this option if you've assigned special permissions to the Help Builder install directory to let your user account read and write files there. Gets you to this topic.